The answers below are based on informal discussions with Dr. David P. Hill and Dr. Roy R. Bailey of the U.S.G.S. For an official U.S.G.S. fact sheet on the Long Valley Caldera, call: 415-329-4668. 1. Where is the volcano? There is no single large volcano with a typical conical shape and central vent. The region of recent volcanic activity (the last 200,000 years) runs from north of Mono Lake to Red Cone, just southwest of Mammoth Mountain. 2. What are the realistic odds of a major volcanic eruption? Small to moderate eruptions have occurred every few hundred years within the above mentioned region. The possibility remains that the geologic unrest could escalate to eruption. However, geologists think that the chances of eruption in the area are small. 3. If the area were to experience an eruption similar to the most recent ones at Inyo Dome (approximately 500 years ago) and Mono Lake (approximately 250 years ago) what would the damage to the town of Mammoth Lakes be? A repeat of the Inyo Dome eruptions 550 years ago would have little impact on the town of Mammoth Lakes. 4. What would be the most likely size of eruption if we were to have one? Eruptions in the last 4,000 years have all been small to moderate in size. Given that history, it’s likely that future eruptions will be of the same small to moderate scale. 5. Would an eruption in the area be similar to Mt. St. Helens? It is very unlikely. Most of the damage from the Mt. St. Helens eruption was caused by the lateral blast, which blew the entire north side of the mountain away (3 cubic km of solid material). Eruptions in the Long Valley Caldera over the last 4,000 years have involved vertical blasts from isolated vents not associated with a large edifice such as Mt. St. Helens. 6. Is Mammoth an active, dormant or extinct volcano? 7. Is there a higher risk of damage from geologic activity in this area than elsewhere in California? No. The risk is comparable to elsewhere in California (and the Pacific Northwest) In fact, Los Angeles area may face a somewhat higher risk because of the many active faults that underlie the Los Angeles basin and the relatively frequent earthquakes of moderate to large magnitudes there in recent years. 8. Are swarms of small earthquakes considered normal activity for this region? Swarms of earthquakes with magnitude in the range 1 to 4 are common in this region and they do not present any immediate threat to life or property. 9. We often hear the media use the term “Volcano Hazard Alert”. What does this mean? The USGS has not used that particular phrase for the Long Valley Caldera region. They use status levels A through N to characterize level of geologic activity for the area. The conditions that trigger E, D, and C status pose little risk; therefore to avoid needless public concern, the USGS only issues an Alert or Geologic Hazard Warning when B or A status is triggered. The media often uses those terms with E, D, or C, creating unwarranted concern and mis-understanding. 10. What is the largest recorded earthquake in the Mammoth area? In May of 1980 there were four magnitude 6 earthquakes in the Mammoth area. There were no injuries or major property damage reported from these earthquakes. 11. What type of monitoring of the activity takes place? 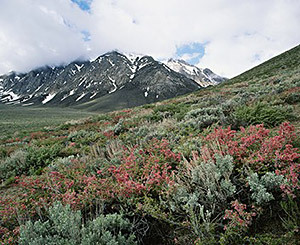 Due to the unique activity in this area, the Long Valley Caldera is one of the best monitored regions in the world. Unlike major earthquakes and other natural disasters, the onset of volcanic activity can be forecast with reasonable assurance, and in the unlikely event of an eruption, the community will be warned of the potential danger.